Due to demand in the area, Dramatic Academy Summer has expanded to include a Show Choir camp! What we have discovered is that a few people aren’t sure what it is! Ever seen Glee? Well, that’s sort of the idea. A show choir piece has all the bells, whistles, singing, and dancing – but none of the dialogue! Here’s how Wikipedia describes it: “A show choir (originally called “swing choir”) is a group of people who combine choral singing with dance, sometimes within the context of a specific idea or story.” Several of our local area high schools have show choirs that compete at the regional, state, and even national level including Hampden Academy, Ellsworth High School, and Hermon High School. Show choir traces its origins as an activity in the United States to the mid-1960s, though cultural historians have been unable to determine the date and location of the first “true” show choir group. Two groups of touring performers, starting with The Young Americans in 1962 and followed by Up with People in 1968, traveled extensively throughout the country in the 1960s and 1970s, performing what could be called the show choir concept. When students and directors of the day saw these organizations, they would, in turn, start similar groups at their high schools. 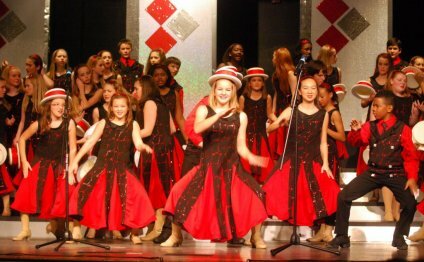 Most show choir “shows” or “sets” consist of a variety of songs, often including several choreographed, fast-paced pieces and one slower piece performed with limited or no choreography. This slower number—usually a ballad—exists primarily to showcase the ensemble’s singing ability. More often than not, the a cappella selection is also the ballad, as it is much easier to sing unaccompanied while holding relatively still. “Show Choir Camp” at PTC will be a boot camp for those wanting to learn what it takes to become a “real life” Glee member! Colin Graebert will join the PTC faculty as Musical Director. Colin has worked with both middle and high school show choirs all over the state as a musical director, accompanist, pit conductor, and arranger. Mr. Graebert will work with students on individual vocal technique as well as with the group to focus on choral singing. Education and Outreach Jasmine Ireland. Ms. Ireland has been performing or working with show choirs from all over the state for the past twenty years. Jasmine has received numerous state and national awards for her direction, staging, and choreography of show choirs.